The April 2015 Rethinking Research Partnerships seminar focused on the theme ‘establishing and sustaining partnerships’. One particular research partnership was examined as a case study, and the analysis and discussions pulled from the rich range of experiences of everyone in the room. The crowd comprised a combination of academics, practitioners, and those with their feet in both worlds (sometimes called ‘pracademics’). As we discussed the challenges inherent to NGO-academic partnerships, a participant suggested that the dichotomy between NGOs and academics is often exaggerated. This led us to discuss the spectrum of types of research collaborations. One extreme is the complete independence of the partners; that is, complete division of both labor and influence. This might consist of the NGO focusing exclusively on program delivery and the academic institution only on research, with no collaboration on any of the activities (though the project as a whole would be a collaboration, with each partner in charge of certain parts). The other end of the spectrum is the complete ‘co-production’ of research, where the partners have equal status and influence within the collaboration, and both have a voice throughout the research process. It may be that neither of these extremes ever occurs in practice, but there seems to be a gradual shift in the field of international development from the pole of independence towards that of closer collaboration throughout the research process, with an eye towards facilitating research to practice. The idea of co-production, however, often elicits a strong response. To some academics, co-production may sound threatening, as it suggests a loss of control over the research process. On the other hand, many academics acknowledge that collaboration is actually necessary to facilitate a smooth research process by ensuring buy-in, allowing access to research participants, and troubleshooting issues in research implementation. Similarly, practitioners express a range of reactions to the idea of co-produced research. Some are eager to have a voice at the research table, and find it empowering to be involved in key decisions to ensure that research is useful for practice. In contrast, some NGO practitioners subscribe to the view that their NGO ‘is not a research organization’; these practitioners are often happy to do their programmatic work and let academics get on with their research. All of these points of view, and others, were voiced in the April seminar. Co-production may also scare both academics and practitioners because most realize that it takes time and effort to work closely together throughout a research process. Perhaps the word ‘co-production’ isn’t the most useful term given that some of the seminar participants don’t consider complete co-production to be a meaningful goal. The term ‘collaboration’ seems to have less baggage attached; few would take offence to a ‘collaborative research approach’ or a ‘research collaboration’. Yet, the word ‘collaboration’ is not particularly strong; it can be interpreted in many ways, including partnerships that doesn’t actually satisfy the intention of a co-production approach- that is, an equal partnership with all partners having a voice to jointly define research questions and approaches. Regardless of the term, a partnership that engages such an intention is likely to contribute to the generation of meaningful and useful research that has the potential to inform practice. As discussed at length in the seminar, research partnerships are carried out and maintained by the individuals involved; therefore, each partnership effort is shaped by individuals as well as institutions. In addition to the approach of whole institutions, or an exploration the NGO / academic dichotomy, it is also important to consider the individuals involved and their own capacity, personalities, and expectations. In the discussions at the seminar series, there was general agreement that it is useful to acknowledge the range of preferences that individuals, and institutions, may have in terms of the nature of their collaboration in research partnerships. In the seminar, we retrospectively examined each partner’s roles throughout the research process. In the context of establishing and sustaining research partnerships, it may well be that any research partnership would benefit from an early and intentional process to articulate each partner’s expectations of their role and optimal division of labor. This could be initiated at the beginning of a partnership, but revisited throughout, when there is room to change preferences and redefine roles as the project evolves. As such, inspired by the seminar, I am sharing a draft of the Collaborative Research Diagram, which could be used to express the level of influence that each partner would like to have at each point in a research process. When starting a new partnership, it may be helpful for each partner to complete a version of this diagram and to use it as a basis for negotiation of roles and responsibilities. The Collaborative Research Diagram below in figure 1 shows a hypothetical scenario in which each partner articulates their preferred level of influence at different points in a research process, using a scale of 0 (no influence) to 5 (highest influence). The examples below are not based on any specific partnership, they are simply illustrative. In some phases of the research, the diagram may clearly show which partner would take the lead. 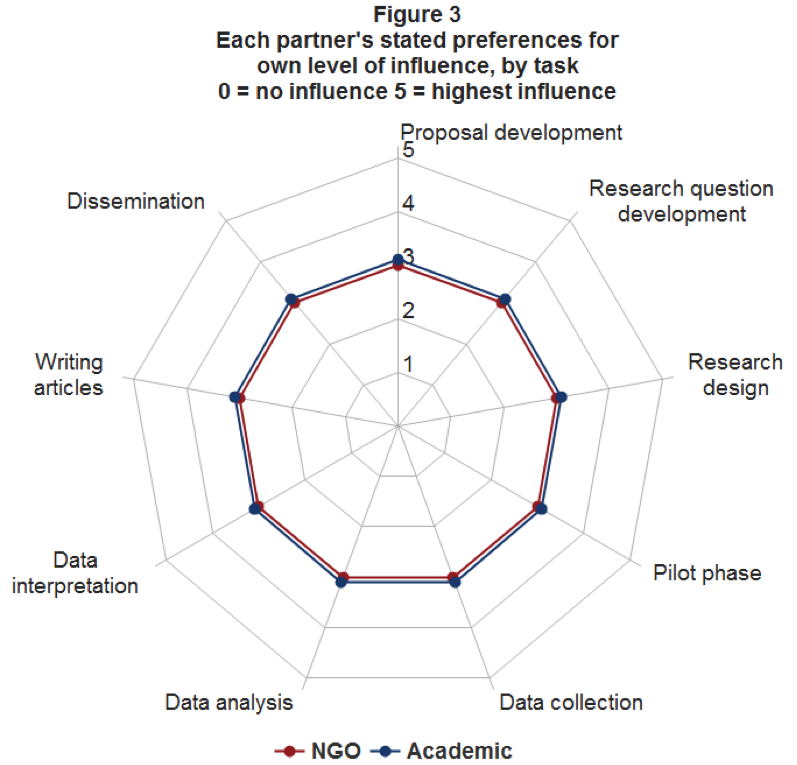 In this example, the NGO states a preference for highest influence (5) in proposal development while the academic partner prefers little influence (2), so the NGO would logically take the lead on that task. In the case of data interpretation, however, each partner rates their own preferred influence at a ‘3’. As both want the same level of influence, there will likely be more negotiation needed on the roles and division of labor for data interpretation; it is likely that the partners will be more closely collaborating in carrying out this particular activity. In the case of dissemination, the NGO prefers the highest influence possible (5), and the academic also prefers high influence (4). This is likely to be another area of close collaboration; both partners would like a strong influence so the roles may also need to be negotiated carefully. In another hypothetical situation illustrating complete independence (figure 2), one entity is always a 5, the other is always a 1 (in terms of their preferred influence). This may signify little collaboration during the research process, because there is a nearly complete division of labor. However, this is an unlikely scenario, as most partnerships are established with an expectation of at least some collaborative work. In a final hypothetical situation (figure 3), both partners have the same level of influence (3) at every point in the research process. The two circles overlap at all data points. This is also an unlikely scenario, as it may indicate that no one takes the lead on any given task and both partners have equal influence throughout, and fails to recognize the distinct expertise that each organization brings to the table. In practice, to both work efficiently and capitalize on each partner’s expertise, one partner will usually be the lead for each activity, even if both partners have an equal voice. Based on the conversation at the Rethinking Research Partnerships seminar, and on further discussions among a smaller group, we think that the Collaborative Research Diagram can be used as a basis to negotiate roles and responsibilities in new research partnerships. It could also be referred back to at different points in time over a research collaboration to systematically ‘check in’. This may be particularly useful in longer projects with shifting staff members, where roles and responsibilities are flexible and can be renegotiated along the way. As well as accommodating staff changes in the life of a project, with different individuals bringing different interests and skills to the table, this tool could also respond to the learning dimension of partnerships. For example, if the research interests and capacities of NGOs increase with their involvement in the research project, their preferences for their role in the research partnership may change as a result. IPPF plans to pilot the use of this Collaborative Research Diagram later in 2015 to see if it is helpful in supporting conversations about roles and responsibilities for newly established research partnerships. We hope its use will promote careful consideration of the nature of collaboration within a research partnership, and provide a platform for negotiation about roles and division of labor. The April Rethinking Research Partnerships seminar highlighted many of the tensions that can arise in a research partnership, and some of the ways that NGOs and academic institutions differ that may exacerbate these tensions. The seminar also called attention to the importance of individuals and individual relationships, as well as institutions and institutional relationships, in shaping a partnership. The belief that research partnerships ultimately improve the quality, relevance, and utility of research has motivated seminar participants to consider how the tensions implicit in these collaborations can be better understood and addressed. I hope that the Collaborative Research Diagram can inspire reflection and discussion to promote effective collaborations, wherever they fall on the spectrum between independence and co-production.